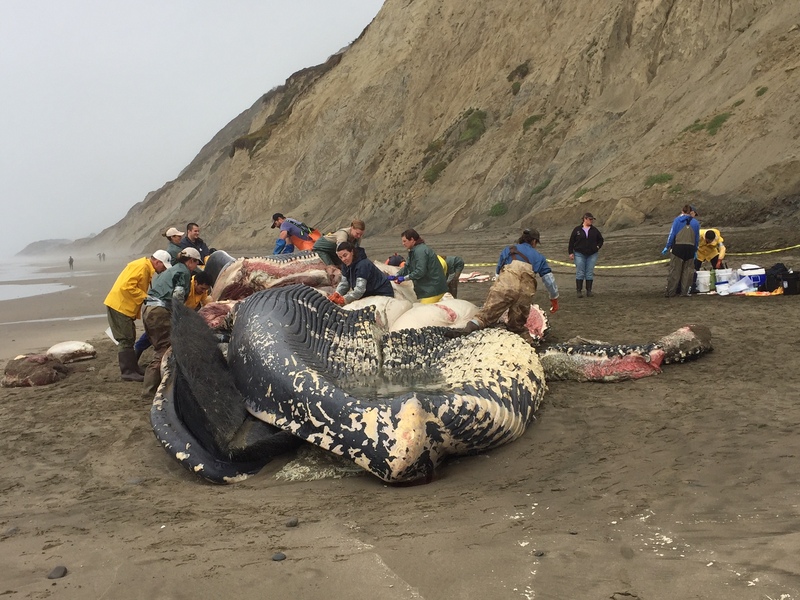 Scientists are still seeking answers in the rare beaching of a blue whale in Northern California this week. The 65-foot male washed ashore Wednesday on Westmoor Beach in Daly City. On Thursday scientists dissected the carcass in an effort to determine what killed the endangered cetacean. About twenty scientists crowded around the carcass, about the length of one-and-a-half school buses. Barbie Halaska, from The Marine Mammal Center, was one of those sawing into its thick flesh with a serrated knife to extract tissue samples. “We actually take the blubber pieces so it can be analyzed for contaminants, so it’s a really thorough way of finding out how deep the contaminants may go,” says Halaska. Some blubber samples were so heavy, it took two-person teams to haul them away with meat hooks. The California Academy of Sciences took pelvic bones and TMMC took tissue and blubber back to their respective labs for further analysis. The center will analyze the flesh for contaminants like DDT and flame retardants. During the necropsy, the researchers discovered evidence of blunt trauma -- multiple fractures to the base of the whale's skull that could have come from colliding with a ship. The National Oceanic and Atmospheric Administration says vessel strikes and "fisheries interactions" -- like entanglement in fishing line -- are primary threats facing blue whales. The Marine Mammal Center says it may take months before it determines the exact cause of death. 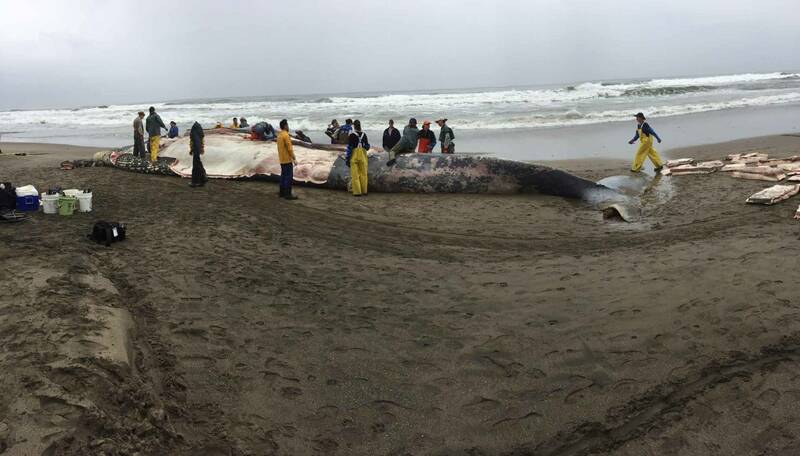 The last time a blue whale washed up in the Bay Area was in 2010. Though their normal life span is largely unknown, blue whales are the world's largest animals, sometimes growing to more than 100 feet in length. The mammals are largest in the Antarctic and are smaller off the U.S. West Coast. 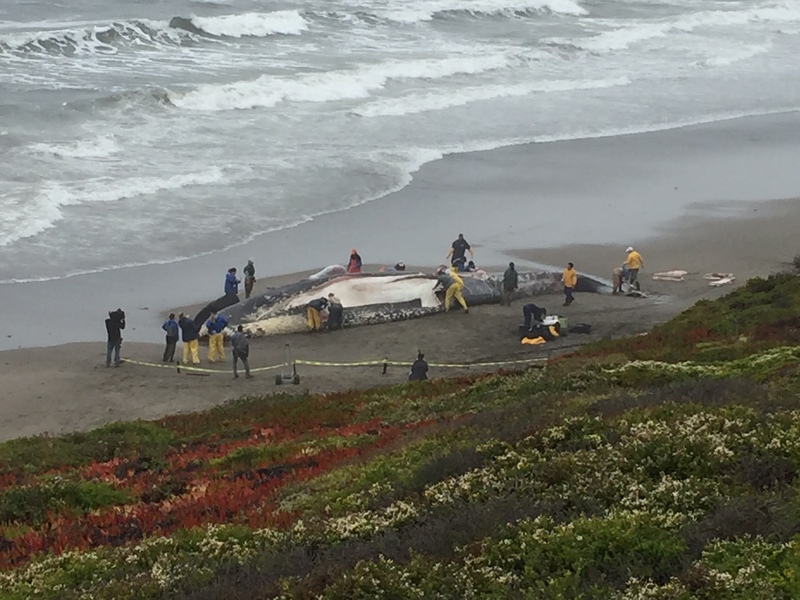 TMMC says the whale that washed ashore Wednesday is a juvenile to sub-adult, i.e. a teenager. 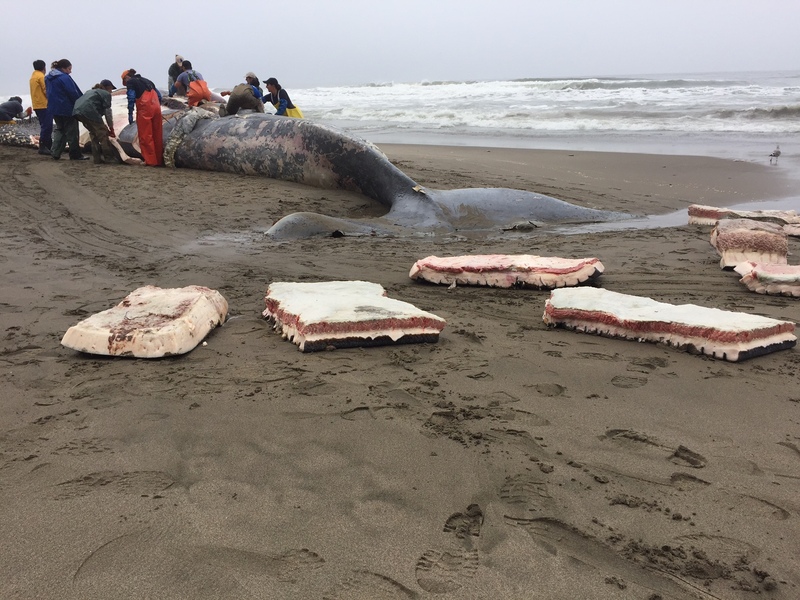 The Center reminds onlookers that it's illegal to remove any part of the carcass under the federal Marine Mammal Protection Act.